I grew up in Chino Hills, CA and now live in Los Angeles. I’m attending school for Rehab counseling and I also work at a high school for special-ed. Hey Moon Designs has become my creative outlet. It’s a fun thing that I really like doing, I like the people I’ve been meeting. I feel like it’s really important to be working with other women and getting our creative juices flowing. I honestly love being around people and helping people, that’s where my inspiration comes from. Helping people thrive makes me feel good and makes me better at what I’m doing. 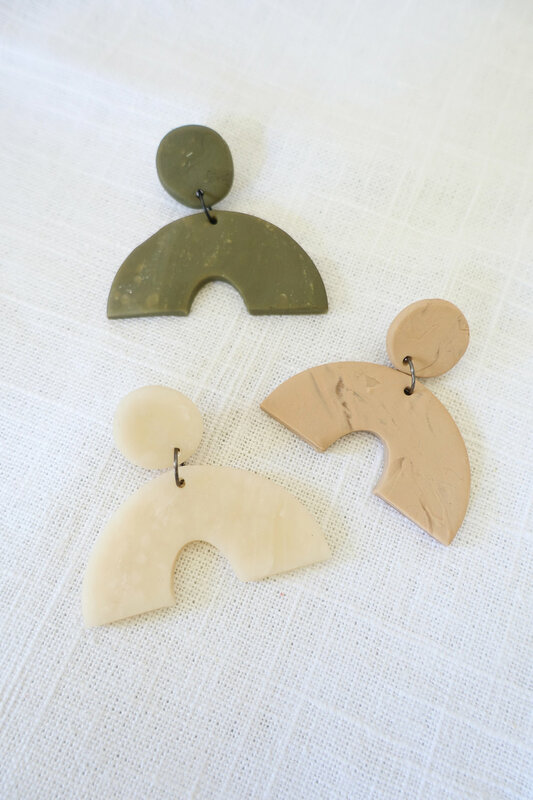 Hey Moon Designs is minimal statement pieces for everyday wear. The name ‘Hey Moon’ actually comes from one of my favorite songs by John Maus. I love costume jewellery but I try not to make my pieces too big so they can be worn everyday with everything. We’re moving towards being more ethically aware - having less is more. I use more neutral earthy tones - which I find great for moms who don’t have the time to accessorize or for women going to work places that can’t necessarily have loud jewellery. I also make sure to price my pieces so that it’s affordable for everyone to wear. It was November 2017 - almost a year ago! I have eczema so I started making necklaces for my sensitive skin and I really didn’t know what to expect. My sister has a shop in Long Beach and asked me to sell some of my necklaces there; that’s when I started making my own pieces and received a lot of positive feedback. I’ve focused on really expanding this past summer, and it’s taken off! This has been an organic way to meet other people, which makes me so excited - I love connecting different people together. I like to use fun pieces; but they’re light, earthy, and hypoallergenic - it’s perfect for sensitive skin - and they’re good statement pieces. Starting Hey Moon Design has been a whole new world for me. I learned about being a business woman, about myself, how I grow, and where I get my support from. I’ve tested my limits about balancing everything else in my life and learned to be vulnerable and try something new. It’s easy and it goes with everything.